One of my favorite ways to serve pasta is with olive oil, parmesan cheese, garlic and lemons — and, of course, fresh parsley — which I put on just about everything! You should always have a few boxes of pasta in the cupboard. It keeps for a long time, and is always good for an emergency meal when you can’t think of anything else to make! 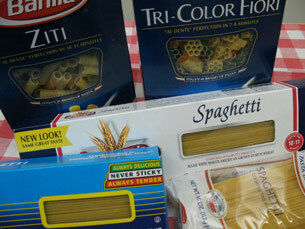 Stock up on pasta when it goes on sale and buy all different shapes and sizes. Be sure to always have some olive oil on hand as well. 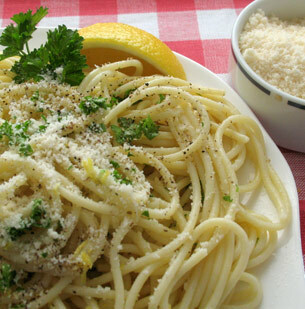 For this recipe you really need to use fresh garlic and fresh lemons and fresh parsley. Garlic powder, dried parsley and lemon juice from a jar just won’t cut it in this recipe. Start cooking your pasta according to the directions on the package. 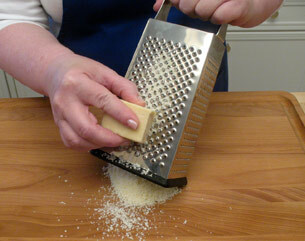 Grate about 1/3 cup of parmesan cheese. Wash 2 lemons. 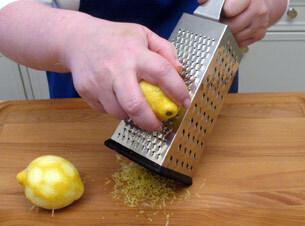 Before juicing the lemons, we need to remove tiny shreds off the peel of the lemon. This is known as lemon zest. 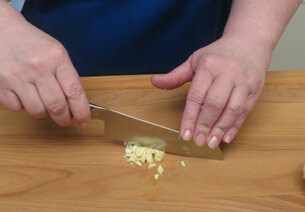 You can use a grater or a knife and just cut the zest into really tiny bits. Be sure to only use the yellow part of the lemon peel. The white part tastes bitter. Now juice the lemon. We actually need 4 Tablespoons of lemon juice. 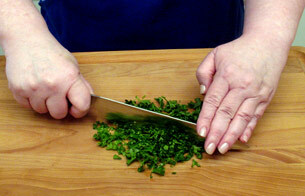 Then chop about 1/2 cup of fresh parsley. 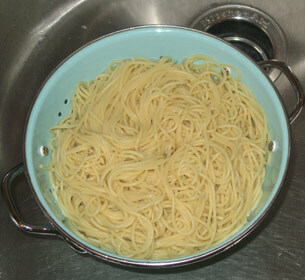 Once the pasta is cooked, remove one cup of the cooking water. 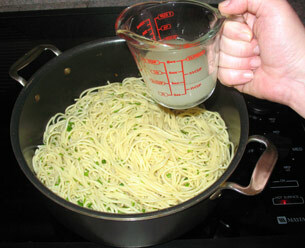 Using the pot you cooked the pasta in, heat 3 Tablespoons of olive oil. 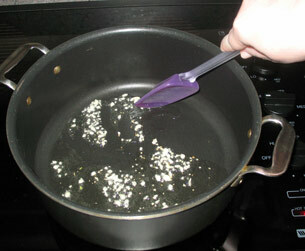 Add the garlic to the oil and fry it, until you can smell it cooking, about 15 seconds. Turn off the heat. 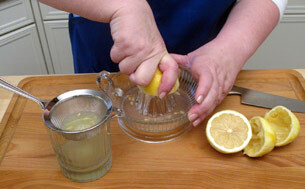 Add the lemon juice and zest to the pot. 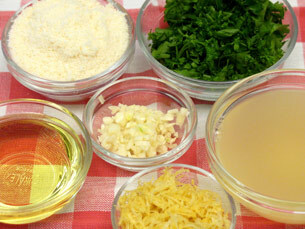 Then add the pasta to the garlic and oil. With a pair of tongs or two spoons toss everything together. 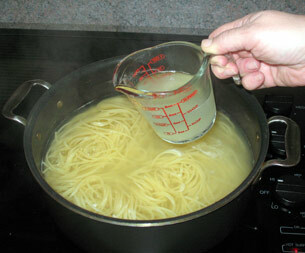 If it seems too dry, pour on some of the reserved pasta water. 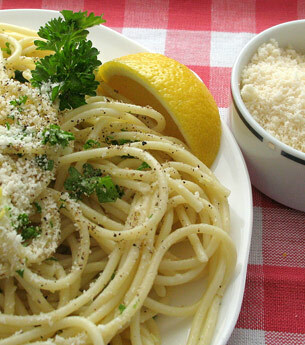 Serve with lots of parmesan cheese, salt and freshly ground pepper. 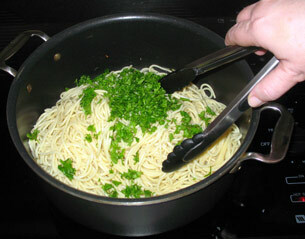 And of course, garnish with fresh chopped parsley! Lovely and delicious, Kathy ! I tried it out and it was GREAT! So simple, yet such a fragrant dish. Yum! I added cooked diagonally sliced asparagus to the pasta before serving! Great idea! You can actually add the asparagus to the pasta in the last few minutes of cooking the pasta. It will cook up in just a minute or two. This was incredibly good, thank you very much. It was very easy to make and really good! I also used lemon olive oil. This is one that I will definitely make again! 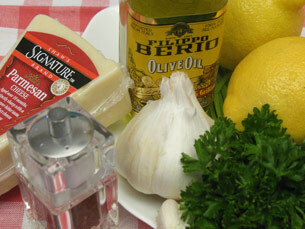 I to love lemon flavored olive oil as well as basil olive oil. They add such a wonderful flavor to pasta and vegetables. The tang of this dish is what interests me. Pretty exciting to make. I haven’t tried this yet, but it sounds wonderful. I was thinking about using it as a base recipe using angel hair pasta and adding some very small shrimp. Also, maybe put a few sliced cherry tomatoes, a bit tucked in on the top, to add a splash of color. I find angel hair pasta a bit tricky to cook. Anne, do you have any tips on cooking angel hair pasta? My husband and I prefer angel hair pasta, which is what I do cook. I found the secret was using a lot of water for cooking; otherwise it becomes sticky. We don’t eat shrimp, but the tomatoes sound like a great addition to the asparagus! Do you add oil to the water as well? I think angel hair pasta is tricky to cook, too. I don’t use it very often because of that. But, it seemed appropriate for a very light dish. The only tip I can think of is to watch it closely and don’t be afraid to take a strand out and taste test it. You could use any fine pasta for such a light dish. Just remember that pasta keeps cooking even after you have drained it. I thought I answered this, I guess I closed out the page without posting. No, I do not add oil, I’ve heard it prevents sauce from clinging to the pasta. I do add salt and use a large enough pot with plenty of water. And stir it during the first minute of two. I have to agree with Janet about the oil. I think the salt is kind of iffy because some people are really watching their sodium intake. But, she hit the nail on the head with using a large enough pot and plenty of water! 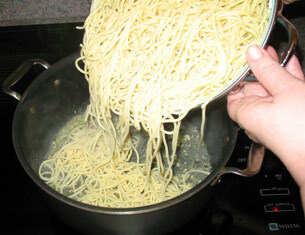 Also, when you stir your pasta, you probably want to swirl it like a figure 8 to help prevent clumping. Thanks Ann and Janet for sharing your helpful tips. I know the beginner cooks who follow my blog will be most grateful! I can never remember to the submit comment ‘button! All these recipe comments and I just had to go buy asparagus, fresh lemon and cherry tomatoes! What’s for dinner tonight? This yummy recipe!